Excellent pub that I very regularly visit. Best in the area by some margin and has a friendly atmosphere, good food and zero trouble. Currently threatened with closure because the owners (property speculators) want to turf out the landlord turn it into flats. Totally inexplicable decision for a thriving pub! This pub is fabulous. Warm welcome whenever you go, solid food menu and good range of drinks. Live music is good, and when the sun is shining the outdoor area is perfect for catching some sun. A little off the beaten track of main transport links, but worth the walk. 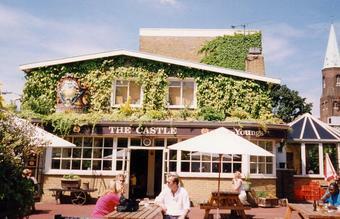 Nice day time summer pub due to big garden (for London). Crap pub building (square box - think 70s council estate pub) but they've done wonders with it. Really nicely done. Bar staff are lovely. Client�le are 99% awesome. This was the worst of 14 pubs I frequented on Saturday. After trying the two obvious doors at the front of the pub, I finally found a way in at the third time of asking through a side door. I was immediately greated by a raucous cheer from a group of young men at the far side of the bar. I didn't think my entry would cause that much excitement. But it soon became apparent that these lads were playing drinking games and consuming a tad too much alcohol. Whilst my 14 pubs sounds bad, I think they had drunk more in this pub than I managed all day. Nevertheless, I took a pew at the bar whilst the shouts and cheers continued. How the one guy had managed to fall asleep on a sofa, I'll never know. Youngs Ordinary, Wells Bombareindeer (very original festive name) and Sambrook Wandle & Powerhouse Porter were the real ales. Coloured pictures of London landmarks gave the pub a kind of artsy feel. But my lasting impression of the pub would be of the rowdy group creating a noisy and unwelcoming atmosphere. The bar staff seemed scared or at least unwilling to tell them to quieten down. Unfortunately, whilst they were enjoing themselves, I doubt most people in the pub were.